No special preparation is needed for this procedure. Local anesthesia may be used. It will numb the area being treated. Shave biopsy—A special blade will shave off a thin piece of skin. Punch biopsy—A special tool is used. The tip of the tool is pushed into the skin. As it is pushed down, the tool will be turned. It will cut a circular sample of skin. The sample will show all of the layers of the skin. Stitches may be needed to close the hole. 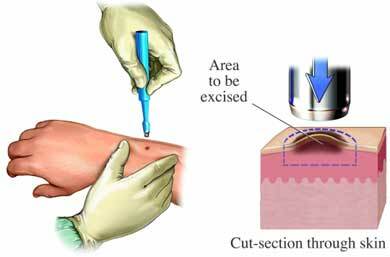 Excision biopsy—The entire area of abnormal skin will be removed with a scalpel. This biopsy will make a larger and deeper hole in the skin. Stitches will be placed to close the hole left in the skin. After the procedure, a clean dressing will be placed over the area. There may be some pain and discomfort after the procedure. Medication can help to manage the discomfort. .
Once you feel ready you will able to leave. You will need to follow some basic care steps once you are home. This will include keeping the area clean and dry. You will also need to watch for bleeding or signs of infection. Stitches will be left in the skin for 3-14 days. Your doctor will check in the area to make sure it is healing as expected or remove stitches. It can take 2-10 days to get the result of your test. Biopsy of Skin. DermNet NZ website. Available at: https://www.dermnetnz.org/topics/skin-biopsy. Updated September 2016. Accessed March 27, 2018. Skin biopsy. Kids Health—Nemours Foundation website. Available at: http://kidshealth.org/en/teens/skin-biopsy.html. Updated June 2015. Accessed March 27, 2018.